Immune responses result from a complex series of interactions among immune regulatory and effector cells. These cells include various subpopulations of T lymhocytes, B lymphocytes, macrophages and natural killer (NK) cells. The immune regulatory network can clearly be modulated by lipids; of these, polyunsaturated fats have generated substantial interest. The importance of dietary fats, in particular polyunsaturated fats, in modulating immune reactivity has been well documented (1–5). Both the fat content and the degree of saturation of the fat influence how dietary fat might affect immune competence. Many studies have concluded that diets which are high in polyunsaturated fat content are suppressive to T lymphocyte function. 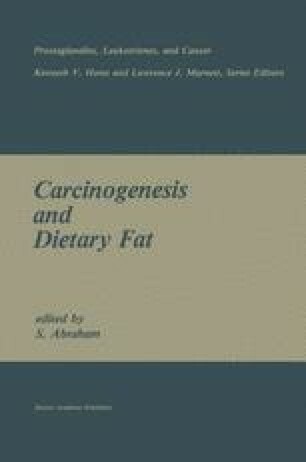 For example, spleen cells of rats fed 24% polyunsaturated fat in the form of corn oil (n-6) had a reduced proliferative response to T lymphocyte mitogens as compared to spleen cells of rats fed either 24% saturated fat in the form of beef tallow or a control 5% mixed-fat diet (6). Likewise, dietary administration of 10% corn oil or of 10% linseed oil resulted in a lower T cell blastogenic response than did administration of 10% hydrogenated corn oil (7).